Busy retailers need to consider a multitude of details when planning for a holiday season. In order to meet the needs of customers during a rush such as Black Friday or Christmas, retailers must always be logistically proactive in making sure seasonal displays and products get delivered on time and in ideal condition to attract customers. Even for day-to-day operation or a brand new rollout plan, having an excellent third party logistics provider will guarantee that all customers are satisfied while business runs smoothly. Planning to setup successful POP displays means the displays and products must arrive on schedule and organized in order to maximize efficiency. Working with a 3PL provider can take care of the many details of preplanning an upcoming holiday season, ensuring sales will go smoothly. Using technology that helps scan for and manage issues, a great 3PL provider will assess and correct any potential problems before they have a chance to occur. Your 3PL can also handle all of the logistic planning needed to execute a flawless holiday season, alleviating some of the stress that retailers experience during busy seasons. 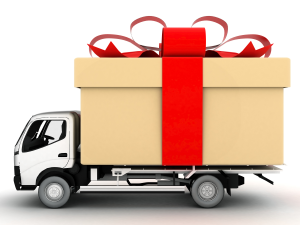 Many retailers can make the mistake of using logistics providers that are behind the times. Oftentimes these dated methods are far from the most efficient way to order and transport displays and products. These inefficiencies slow business and create lags in schedules, leading to extra costs and exceeded budgets. By handling all details of the ordering process, 3PL providers cut out many of the “middle men” which may cause confusion and slow the process for retailers. Retail-specialized providers will ensure the most efficient method for ordering, transporting, and delivering all POP displays so retailers can spend their time focusing on the daily needs of the store, rather than the transport of materials. A number of risks are involved with the transport and delivery of holiday POP displays, including the collection of dust or dirt, corrosion of materials or exposure to the elements. These hazards, combined with the risk of damage due to jostling during transport, can weaken the overall effect of these displays and therefore must be avoided. An experienced and professional 3PL provider will guarantee that all POP displays will arrive safely and in the condition they are meant to be. Searching for the safest and quickest route ensures that POP displays are minimally handled and protected through their delivery. One of the most important steps to a successful holiday season is ensuring all products and POP displays arrive on time so that merchandise can hit shelves as soon as customers demand. During the busiest seasons of the year, retail employees may become disorganized and struggle to order deliveries properly—resulting in product campaign delays and lost profit. By allowing a qualified 3PL provider to handle the details, retailers can focus on running day to day business rather than worrying about the timing of deliveries. 3PL providers specialize in delivering freight on time, whether it’s for a holiday rush, restock, or rollout operation. STC Logistics ensures timely and safe deliveries for any season with a 99% on-time delivery of undamaged goods for the last 15 years. As a retailer, there’s no reason to stress over the details of making sure POP displays are handled and delivered correctly when dedicated, professional 3PL providers are willing to make sure each step in the process is controlled perfectly. Making sure each display is ordered in a timely fashion, transported carefully, delivered on time and in great condition, STC Logistics manages any potential issue that could interfere with an entirely successful holiday rush or rollout. An experienced 3PL provider ensures a seamless delivery service, helping any retail establishment avoid challenges during the most demanding time of the year.